HomeOn The SquareMeet Georg Jensen! 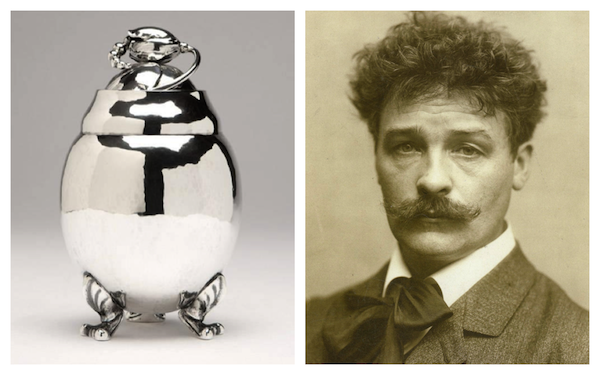 Danish artisan Georg Jensen is widely considered one of the most gifted silversmiths of any era. The son of a knife grinder from the town of Raadvad just north of Copenhagen, his education in the fine arts alongside his metalsmith training allowed him to revive the tradition of the artist craftsman. Born in 1866, Jenson trained in goldsmithing at age 14, but an ambition to be a sculptor led him to studies at the Royal Academy of Fine Arts. After graduation he spent time as a sculptor, then moved on to ceramics and pottery before finally, in 1901, arriving back at metals. On Tuesday, June 16, John Moran Auctioneers keeps the memory of George Jensen alive by offering seven lots by the Danish Master in their Decorative Art sale. 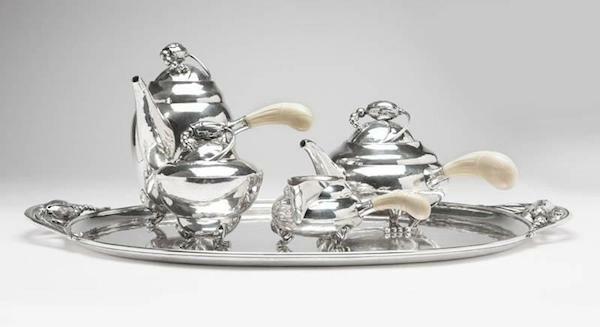 Leading the way is Lot 1143 (below), an outstanding 1926 sterling silver coffee/tea service. Coming in the Blossom pattern designed in 1908 by Jensen, this sets comprises a coffee pot and teapot, both with bone handles, a covered sugar bowl, a creamer with bone handle, and a dual-handled tray. 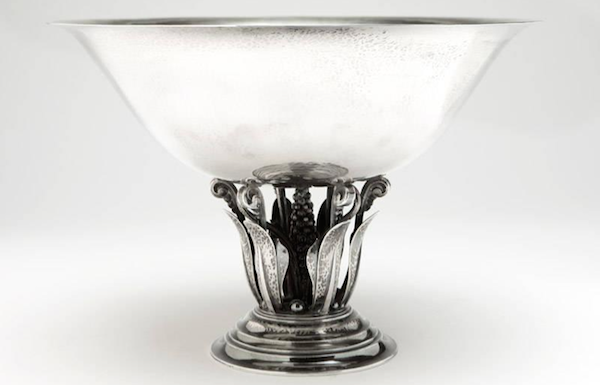 Another lot sure to please is Lot 1163 (below), the sterling silver centerpiece No. 196. Made by Jensen in the early 1930s from a 1916 Johann Rohde design, the flared circular lightly hand-hammered bowl, supported on three pairs of scrolled foliate supports, is the ideal patron for the dining room table worthy of its grandeur. Lot 1144 (Top left), a sterling silver “Blossom” tea caddy, is sure to impress even the most imposing of mother-in-laws when time comes for a brew. Made in 1930 from a 1908 Georg Jensen design, its sleek oval body is timeless, presenting beautifully on three stylized paw feet. All in all, John Moran Auctioneers’ Decorative Art Auction looks to be a brilliant way to spend your Tuesday, with outstanding offerings ranging from Mid-Century Modern and Contemporary design, to Asian Decorative Arts, and California and American works of fine art. 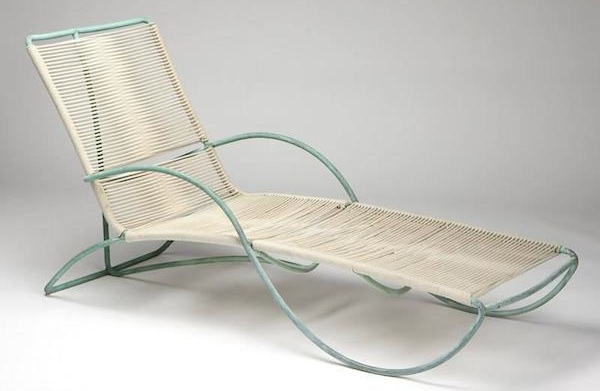 Modern selections include patio furniture by Walter Lamb (above), and pottery by Glen Lukens, Betty Davenport Ford and Gertrud & Otto Natzler. 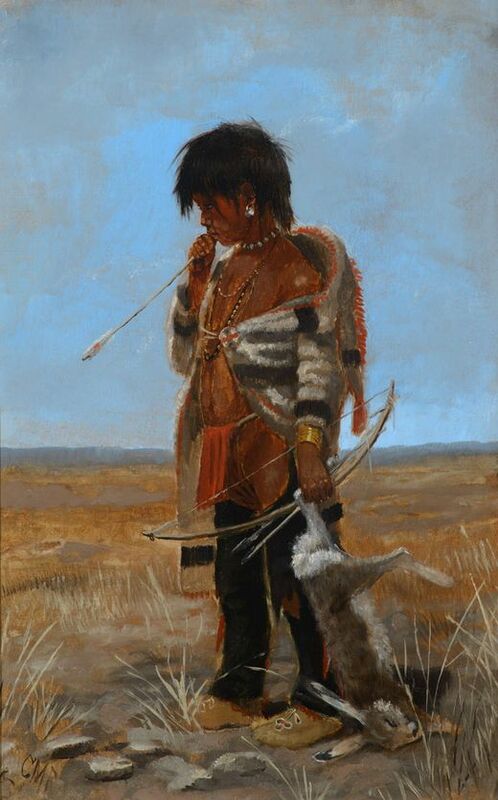 The curated fine art include works by Ha Ding, Robert W. Wood and Liu Miao Chan.